1. Power/Ground: A standard lead/acid type battery can "absorb" power fluctuations, which in turn can mask power/ground issues. Because of their design,lithium batteries are unable to act as a capacitor...absorbing the fluctuations. As such,electrical systems of lithium battered vehicles MUST be correct, in terms of clean grounds, proper power wiring, gauge size, etc. If not, these power issues can affect all of the onboard electronics in the car, including the data system. 2. 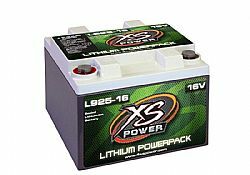 Battery failure: We have seen instances where a lithium type battery failure has resulted in damage to data logger components. This can show up as a loss of random Racepak data channels or possible resetting the programming of Racepak digital dash products.